Ray’s baroque Western Johnny Guitar is an obvious allegory for repression (both political, the film is filled with references to McCarthyism, as well as sexual), but there’s a lot more going on within every frame of this movie. I am inclined to agree with Jake Cole that the film is one of the best examples of how to use color. It’s a fierce, energetic picture, and it’s easy to see why the New Wavers (and later on, Scorsese) were such big proponents of the film. It's also a really damn entertaining Western. It’s become more popular now than ever thanks to cinephiles everywhere championing the film as the director’s best (or a close second behind Bigger than Life), and the film was a box-office hit when released, but what is ironic about Johnny Guitar is that Ray hated making it. Even if he did hate making the film, Ray litters the film with his usual iconoclastic touches that were an affront to everything Hollywood was producing at the time: inverted gender roles (I love how all of the men in this film are afraid to fight, and how, as he did with The Lusty Men, Ray makes a strong, independent woman the protagonist…a role almost universally reserved for men), ambiguous sexuality, baroque colors and a hellish set design in the form of Vienna's tavern. In fact, I like Truffaut’s comment about the film being a “hallucinatory Western,” and it got me wondering (because I love Italian horror so much) if the film wasn’t a huge influence on Mario Bava and Dario Argento and other Italian horror filmmakers who painted their films in similar colors and sought to have a similar ethereal, hallucinatory tone to their films. Ray and his cinematographer Harry Stradling beautifully juxtapose black and white while using vibrant reds as the backdrop — all colors acting as more than just something pretty to look at. Vienna’s tavern is the perfect example of the hallucinatory tone the film has (I can think of no better scene to represent this than the one where Vienna is playing the piano in a white dress with the blood-red, hell-like cavern walls of her saloon in the background). This specific setpiece acts as a symbol for everything Ray’s films are about: it’s drenched in reds — a representation of the kind of hell his heroes usually live in; this is especially obvious at the end as the tavern goes up in flames — and it’s located on the outskirts of town, a place where outlaws, misfits, and the generally marginalized members of this society convene; Vienna’s is a safe haven for the misunderstood in the same way all of Ray's characters, in some way, have sought a safe haven to feel "normal" (the honeymoon getaway at the cabin in They Live by Night, Ida Lupino's cabin in On Dangerous Ground, the rodeo in The Lusty Men and the characters playing "house" in the mansion in Rebel Without a Cause). It's a brilliant film that has gained a lot of momentum amongst cinephiles as one of the premier examples of expressionistic American cinema from the 1950s. After working on the Jimmy Cagney Western Run for Cover, Ray would go on to make what would be his most famous film. I’ve always felt that Rebel Without a Cause was not just merely a tale of misunderstood adolescence; rather, the film is, for me, an enriched and beautifully lit and colored rendition (filmed in Cinemascope adding to Ray’s love for the theme of alienation, isolation, marginalization by keeping images on the very edges of his wide frame) of everything that Ray has been working toward. It’s a film about misunderstood youth, sure, and how when we’re that young, we always feel misunderstood; however, the film also fits in with Ray’s adult characters from previous films (especially the theme of emasculation found in Johnny Guitar and The Lusty Men). That’s because Rebel also is about a rapidly changing domestic world (as well as the public high school) that is unreliable and unstable (fully fleshed out in Bigger Than Life). 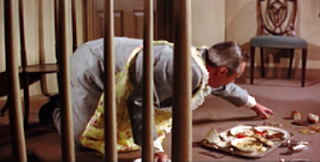 I like Ebert’s assertion that the film plays like a Todd Solondz film (the image of Jim Backus in a frilly apron does seem like something out of Happiness); that beneath the seemingly simple surface there’s something more subversive trying to break through — much like the explanation of exploding stars in the solar system during the scene at the planetarium — something that audiences in the 1950s weren’t used to seeing. I commend Ray for having the balls to make the film as sexually charged as it is. Perhaps it wasn’t as obvious in the ‘50s, but in retrospect, Rebel is one of Ray’s most overtly sexual films. Whether it’s Judy's father (William Hopper) having problems with the maturation of his 16 year-old daughter (Natalie Wood), or, and most famously, the way Ray has John "Plato" Crawford (Sal Mineo) not just idolize Jim (James Dean) the way a misunderstood kid would idolize a fellow peer, but the way he longs for him the way traditional films would show a teenage boy eyeing a fellow teenage girl. I’ve always liked Dean’s performance in this film more than his showy performance from East of Eden, and in one of my favorite scenes he happens upon the image of his father (Backus), wearing that apron over his suit, frantically picking up the food he spilled before his wife can see it. I love the way Ray frames the scene (making it look as if his father is in a metaphorical prison), but it showcases one of Dean’s best bits of acting. The moment starts with a genuine laugh about what the two of them realize is a ridiculous situation, before Jim realizes that his dad doesn’t really get why he’s laughing, and then the scene just turns sad as Jim can’t even muster the words anymore and just leaves the scene disappointed at the way his father has become a prisoner in his own home. Yes, sometimes these familial scenes are a little too on-the-nose, but Ray makes them feel fresh with the buried subtext — even 56 years later. I love Ray’s use of canted angles to show us how askew this world is. 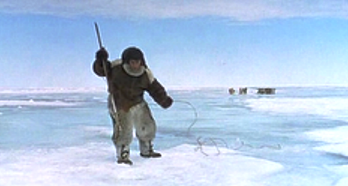 In what may be the best shot of the film, Ray shows the tragic death of Plato by tilting the camera at the sound of a gunshot. It’s this kind of immediacy that we saw with Ray’s use of handheld camera in The Lusty Men and On Dangerous Ground; the kind of immediacy that draws us into the moment so immediately that we cannot help but feel the punch in the gut when the tragic moment of Plato’s death occurs. My other favorite moment in the film is its most memorable (aside from perhaps the initial planetarium scene) as the three misunderstood youths escape from their prisons and retreat to a deserted mansion that acts as nothing more than a brief distraction from the harsh realities of their life; a simulation that they act out for a brief reprieve only to be shattered by reality in a few short moments as the bullies find Plato and chase him to the planetarium where he eventually meets his tragic end. Like he did in The Lusty Men, Ray ends his film with the kind of shot that suggests a cruel reality; despite the tragedy that has just occurred at the planetarium, the final shot is of the building as the sun rises. Essentially, like the rodeo, the show must (and will) go on; future school groups will attend and be given the same lecture as Jim, Plato, and Judy without understanding how the trio’s idyllic world was interrupted by violence and shattered at that very location in mere seconds. Sure, some of the film’s narrative hasn’t aged well, but it’s an interesting portrait of its time; a subversive snapshot of the zeitgeist created by Dean’s performance and the posthumous reaction to it. In addition, it’s great reminder of Ray the iconoclast: I can’t think of any other filmmaker working within the American Hollywood system, perhaps with the exception of Douglas Sirk, who tried to sneak so many taboo (for the time) themes into his films. A year after Rebel Without a Cause, Ray made what many cinephiles consider his magnum opus. 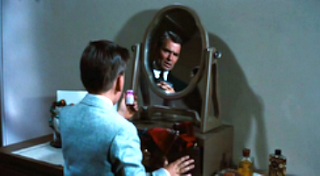 Bigger Than Life fits neatly in the Ray paradigm of busted-up domestic relationships; however, in the case of this film, Ray uses strict father and school teacher Ed Avery (James Mason) as the focal point for him to have a lot of fun at the expense of Eisenhower’s domestic America. Avery isn’t emasculated like other male figures in Ray’s films, but he is totally unreliable despite the fact that he is exactly the type of “fucked-up” hero that Ray talks about in the quote that started this piece. Told he only has months left to live, Avery agrees to the then-experimental drug of cortisone which acts as a catalyst for Avery’s awakening to his dull existence, and what follows is a hellish vision of domestic America in the 1950s (Sam Mendes wishes he could make something this good). I love what Scorsese says about Ray in his documentary A Personal Journey With Martin Scorsese Through American Movies when he claims that Ray offers the viewer two sides of American suburbia, “the sugar and the poison.” That is a great way to describe what Ray is doing with his films, especially Bigger Than Life and Rebel. Since Avery (and Ray) questions every tenet of the 1950s (most notability the role of mother, community, and church), one has to wonder, based on Ray’s quote about the type of heroes in his movies, if Ray doesn’t view Avery as a kind of hero; a complete mockery of the Father Knows Best take on the nuclear family, Ray seems to be having a lot of fun with this one. It’s no secret that Ray did a lot of cocaine and drank heavily, and Bigger than Life feels like it has the headlong energy of a mile-a-minute coke addict. Unlike Rebel, Bigger than Life doesn’t feel dated; it feels of its time with its use of Technicolor, but it also feels very modern by how aggressively expressionistic it is. This is probably why cinephiles today consider it (along with Johnny Guitar) the best example of Ray as auteur and the last truly great film he ever made. The end of the ‘50s weren’t so kind to Ray. He made the so-so Western The True Story of Jesse James which was originally a project designed to reunite Ray and James Dean; unfortunately, because of Dean’s premature death, this version of James was portrayed by the stiff, wooden Robert Wagner. The film is perhaps one of the most unmemorable of Ray’s films; the dullness is accentuated by to the fact that it came on the heels of the auteurs most impressive run of films. Ray would bounce back a bit with the black-and-white war picture Bitter Victory, and the beautiful-looking — yet massively flawed — Wind Across the Everglades which ended up being his penultimate Hollywood-made picture. Ray ended the decade with what would be his final film made in Hollywood, the Cinemascope noir, Party Girl. As was the case for most of these late ‘50s entries, Ray tries his hardest to make them more interesting than they really are by always making them, at the very least, interesting to look at. It’s not that these are bad movies — again, as I stated at the beginning of this thing, I don’t think Ray every really made a bad movie — but considering what the man was putting out earlier in the decade, and what he was going through at the end of the decade (personal and professional problems and a deteriorating health), it seemed pretty obvious that at the end of the decade that immediacy that was all over his previous work was missing. After The Savage Innocents, Ray decided to make two epics in Spain, King of Kings in 1961 and 55 Days at Peking in 1963. The latter would be his final film. King of Kings was notorious for living up to its epic name. It’s definitely a flawed film, but it was a return to theme for Ray as I can think of no other figure in history that was more of an outcast, misfit, and misunderstood than Jesus of Nazareth. Of course, most of the Hollywood films that showcase Jesus don't identify with those aspects of the man (they're too focused on the miracles), but Ray anchors his epic film by looking at these aspects of Jesus in addition to showing some of the miracles and massive exterior shots (to showcase the scope of this epic) that make for the kind of melodramatic, epic cinema audiences were used to at the time. It may seem weird to think that there’s a natural connection between Jesus and Ray, but I think Jesus definitely fits the type of outcast/misfit character type that so often attracted Ray. In King of Kings, one can definitely see Ray’s skill for architectural spaces and filming in such a massive scope that definitely draws upon his early-in-life training in the field under Frank Lloyd Wright. The Sermon on the Mount scene in particular is impressive. Throughout the scene you can see hundreds (hell, maybe thousands) of extras pouring into the frame trying to run to where Jesus is giving his sermon. It’s an impressive piece of epic filmmaking. The other thing I like about the scene is that it seems clear to me that Ray places this moment in Jesus’ life as the defining moment of the man; it represents everything for which he stood, and by placing such an emphasis on the scene we see that Ray also sees this as the defining aspect of Jesus’ teachings. 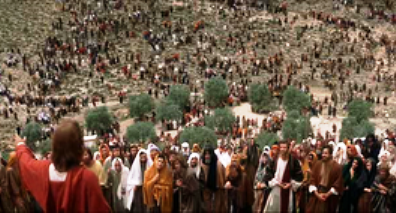 Since the film is centered on this view of Jesus, Ray juxtaposes that with the more pro-active Barabbas, a character who is usually only shown when he is freed in return for Jesus’ crucifixion. Again, Ray is giving a lot of attention to a character who is normally marginalized in the story of Jesus. It only seems fitting that Ray would be drawn to his story as well. King of Kings — coming on the heels of Ben-Hur — was released in the heart of the epic craze, and its weaknesses are glaring. The film is too concerned with its grandeur to be about anything else (not even Ray can save the film from its nearly three hour running time). It’s a little too on-the-nose with its narration (by Orson Welles) telling us every little detail as if he were just reading from The Bible, and the performances (especially that of Jeffery Hunter who plays the typical white Jesus) are universally hammy (which I understand is the norm for these types of movies). Still, considering Ray’s previous handful of films, King of Kings is not half bad as an interesting look into what the man created before his premature retirement. Ray's premature retirement was caused by his next attempt at an epic, 55 Days at Peking starring Charlton Heston, Ava Gardner and David Niven. Perhaps the most notorious thing about the film is that Ray — who was at his worst at this time — claimed to have had a premonition that it would be this film that would end his career. Due to his hard living, Ray was right, and on the set of the film he had a heart attack and collapsed during filming. Even though Ray didn’t finish the film, 55 Days at Peking — like King of Kings — is another example of how adept Ray was at using massive scope and Technicolor. His last two films were a departure for him in scope, but they definitely were examples of how the man knew how to use color to its fullest effect; although, for me, I merely admire his use of scope and color; I’m not moved by it like I was Johnny Guitar, Rebel Without a Cause, or Bigger Than Life. And that’s the biggest problems with Ray’s last films: even though I can admire them, there’s nothing immediate about them. It’s a sad way to think about the end of such a brilliant career. Despite the way his career ended prematurely and sadly left us with a whimper rather than a bang, Ray always will be remembered as one of the ‘50s most distinct voices. His headlong energy and innovative, expressionistic camera left an indelible mark on the cinema of the ‘40s and ’50s and had a global influence on cinema. From Jean-Luc Godard to Wim Wenders (who collaborated with Ray to make a documentary, Lightning Over Water, about his last days as he dealt with terminal cancer) to Martin Scorsese to Jim Jarmusch, Ray’s influence can be seen in a number of filmmakers’ visual style as well as the themes they broach in their films and the types of outsider characters they showcase (especially Jarmusch). His love for solitary, outsider figures has always resonated with me, and when I look at a movie such as Rebel Without a Cause, for example, a movie I loved when I was in high school for all of the reasons that I actually kind of find dated now, I can see what makes Ray so great: it’s the way that I can look at Rebel through a completely different lens now and find different layers to appreciate. 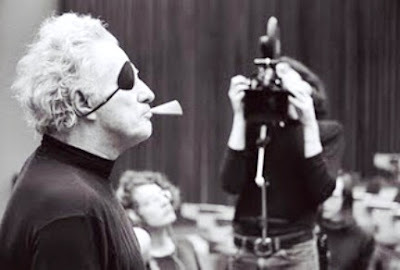 On the surface, Ray’s films always seemed to be about very simple things; however, when one looks deeper they see a filmmaker that had the balls to put things in his films and explicate themes that other filmmakers were afraid to. He — along with the likes of Sirk, Wilder, Kazan, et al — was an iconoclast that sneaked the taboo themes that interested him into his films despite working within the Hollywood system, and because of his audacity and energy, and his need to make films about the marginalized, he made a name for himself as one of the true auteurs of the era. I haven't seenRebel in a long time, but even when I first saw it in high school it felt terribly dated and I preferred Dean in East of Eden. Actually. I think Dean's most fun performance is in Giant (and if they'd put it in supporting where it belonged he might have won). One of the big differences might be that Giant is the only one of the three I got to see in a restored print in a theater. I really want to see Bigger Than Life now, which I've never managed to get around to. 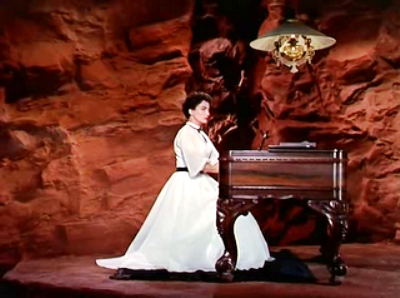 And I forgot to add: How can anyone can anyone not love Johnny Guitar? Huh. Interesting that we have a totally different reaction to Dean's performances. I love Giant, too, but I was just amazed at Dean's performance after my recent viewing of Rebel. 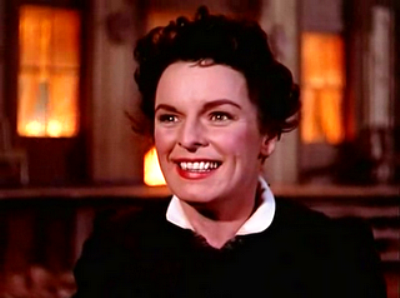 I don't know how anyone cannot love Johnny Guitar...it has an energy to it that is infectious. I've seen it numerous times, and I was only going to watch clips while revisiting his films for this piece...I ended up watching the whole thing again. Thanks for letting me tackle this one; it was a lot of fun! I think my preference for him in Eden has more to do with liking the movie better. I always think I need to revisit Rebel but that initial viewing making me think the film was dated and overwrought always makes me fear that it couldn't have become less dated over time. The funniest thing about seeing Giant is how much the TV show Dallas so obviously stole from it. I laughed out loud when they had a scene when Dean's character is a rich tycoon and behind him is a big symbol for his name: JR. Saw Rebel again recently and it still holds up. Especially impressive is the way Ray has the cinemascope camera tilt with Sal Mineo gets shot. He was an exceptionally talented filmmaker, trying as best he could to stretch the limits of the medium at a time when the medium represented by the studio system was closign up shop. Unfortunately when he went to europe he didn't have Losey's luck in re-establishing his career. Hid films still speak to us nontheless.